If you read yesterday's review, that probably sounds familiar. Young women who "see downtown as a place they want to be" is exactly the group that Elizabeth Arden Untold is chasing, albeit in a different way, or at least, Elizabeth Arden's idealized image of "downtown New York cool" sure doesn't look much like Calvin Klein's. Regardless, it's been an awful long time since Calvin Klein last managed to bottle youthfulness, edginess and cool — arguably, they haven't pulled that off since CK One in 1994.2 Downtown handily manages the youthfulness. Edgy and cool, maybe not so much. Calvin Klein is calling Downtown a woody floral, and maybe it is, although the top notes are nearly candied enough to qualify for a more edible classification. The opening is a pile of sweet fruit, weakened slightly with an aquatic note (the notes: cedrat, bergamot, neroli, pear, watery plum, pink pepper, violet leaf, gardenia, cedarwood, incense, vetiver and velvet musks). Early on, a mild but persistent undertone of cotton candy keeps Downtown from stepping wholesale into pear shampoo territory, but it also keeps Downtown from smelling like anything you might imagine Rooney Mara, or indeed, anybody downtown, wearing with a black leather jacket. Verdict: It's fine. If you'd told me Downtown was a modern designer fruity fragrance geared at a young audience, I'd think it had done its job perfectly adequately. Yes, it's too sweet for me, and no, it's not terribly interesting or unusual, much less superaspirational (really, isn't aspirational enough? do we need superaspirational? ), but someone who likes sweet and who just wants to smell nice (and who finds Euphoria maybe too much of a presence) might find it just the ticket. Probably not perfumista-bait, though. 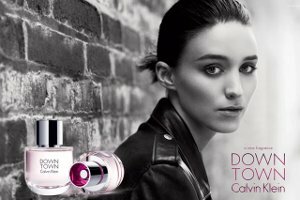 Poll: let your superaspirational side run wild — you look just like Rooney Mara, you're wearing the black leather jacket, you're downtown, doing cool and edgy downtown things.4 What fragrance are you wearing? Let's not make it too easy, so pick something that you can buy in a department store — no niche, no upscale Barneys or Saks exclusives! 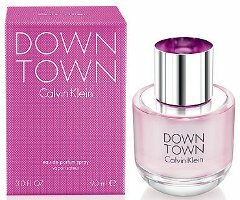 Calvin Klein Downtown is available in 30, 50 and 90 ml Eau de Parfum and in a 10 ml rollerball and 250 ml Body Mist, as well as in matching bath and body products. 1. Women's Wear Daily, 5/17/2013. 2. In my humble opinion, the last time Calvin Klein managed even 'memorable' was with Euphoria in 2005. 3. Calvin Klein Beauty was geared a bit older than Downtown or Euphoria, CK In2U a bit younger. 4. Or you can check out the commercial for inspiration. Mostly, though, Rooney's day seems kind of dull to me — getting a coffee, listening to her iPod in the subway, taking a taxi. But she does dance in the street, cracks a few smiles, and holds some sort of superimportant press conference at the end. Hm. Doesn’t sound terrible but doesn’t sound aspirational, either. At least it probably wouldn’t kill you if you were stuck in an elevator with someone who took a bath in it. For the poll, I’d say Bandit. But then I think Bandit works in so many situations. Maybe Rossy de Palma Eau de Protection if I wanted something just as dangerous but a little more flowery. It’s really not bad. I don’t like the opening but the dry down is reasonably attractive. Tom Ford Black Orchid. I know that scent can be divisive, but I can absolutely see it adding a feminine edge to your other edgy activities. Agree! At least it’s making a statement. I think you can get that in a dept. store, at least online? Idk. Bulgari Black! Available at a Sephora near you. That was the first thing that came to my mind — glad to see it mentioned. My second pick was Hermes Eau des Merveilles. Ooh, Bulgari Black was my first pick, as well. It might be a little too snuggly with the vanilla and powder, but the brooding, muted darkness of it certainly fits with Mara’s image, IMO. Weird answer. No idea where it came from! I can also imagine her wearing something super powdery and feminine – the opposite of the biker chick/masculine image. Maybe Love Chloe! Yes, that would work too. Downtown is just too plain. Oh, I would go right to Bulgari Black. And I see I was beaten to it while I was composing! Second choice — Dior Homme. Haha, sorry about that! DH is a good pick — it makes sense here to borrow from the guys, I think. Ah, I can see Dior Homme. I’ve tried downtown and just found it hilarious, fair enough I didn’t wait for the drydown.. I see her wearing Terre d Hermes edt or Chanel 19. It’s she is ” edgy” enough for layering I’d suggest Terre edt+ JPG Classique edp. I did myself on a very cold day and everyone asked what it was so they can buy it! Oh, Terre d’Hermes is perfect. Or can you get Agent Provocateur at department stores/Sephora? I find it pleasingly dirty-smelling. Don’t know, but it’s not niche so it’s ok. Agree w/ pleasantly dirty. I find it a little too dirty to run around town with, at least during daylight For me, Agent Provacateur is for the bedroom or a very hot date..
Super-Aspirational = will be Chairman of Goldman Sachs, take it private once again, then become a majority owner, all before the age of 40. I think all these fragrance companies read the same demographic trend reports and just rearrange the buzzwords or talking points. True. But I think what they’re going for is someone who doesn’t live downtown, but thinks it must be awfully cool to live downtown. And fair enough, that person might not *really* want to smell cool & edgy, but all the same, seems cynical to serve them up such decidedly pedestrian stuff. Can’t stop laughing at superaspirational. Anyway, my first thought was Black, but then I thought it might be a little obvious. Why not go for some unexpected contrast of an edgy leather jacket with superaspirational No5? Terre d’Hermes was a nice suggestion, though. Absolutely — and surely No. 5 is the mostest superaspirational anyway. Hahaha both of you crack me up. Yatigan or Creed’s Love in Black, or are they niche?? Oh, like the idea of Yatagan. I guess Creed is sorta niche. Nice choice, I like it! I’d be wearing YSL Nu, even in the reissued version. Maybe I’m getting old – I remember trying this fragrance a couple of weeks ago but I do not remember it at all. And this (unknown to me) actress does not help at all. Who is she – Keira Knightley on a shoestring budget? She’s a good choice, actually — a better match for the concept than the fragrance itself is, it sounds like! She played Salander in the American remakes of the Girl with a Dragon Tattoo movies and was in Steven Soderbergh’s most recent twisty thriller, Side Effects. Noomi Rapace, from the Swedish original GWADT movies, would be even better! But the superaspirational girls probably wouldn’t recognize her. I will try this, but it doesn’t sound like it will impress me. For my big city scent…Gucci Rush. Always has been, always will be. As long as Sephora keeps stocking it anyway. Bulgari Black my number one choice, baring that, Armani Code. I think BB is getting the most votes. I think I might swing downtown in my black leather jacket and skinny jeans wearing M7 – I bought it for my DH just so I could wear it. Or maybe Madonna Truth or Dare – floral but with a medicinal edge to it. Nice. I like M7 & forget to wear it. Great poll idea! I pick Habit Rouge. As for the poll, Ms. Mara doesn’t look very far on the edgey side, no tats, no piercings other than discreet earings, perfectly groomed. Actually, the kind of girl who shops for perfumes in Barneys. True — her most edgy feature is her general forlorn expression. Then again, tattoos and piercings have become so popular/common that not having them could represent not following trends? John Galliano edp comes to mind. And Sahara Noir by the way. Sahara Noir is an excellent pick! That’s some good stuff. She’s a tough chick. I see her in Chanel Antaeus. Cartier Baiser du Dragon to go with the dragon tattoo? Fahrenheit is another great choice. Looks like she’s either getting something older than 10 years, or she’s getting something masculine, or both. Hm coming far too late to the game to propose Bulgari Black I will throw out some Diors instead–Hypnotic Poison or Dune? Something not for the faint of heart. And just to add to the pile of JPG–Le Male also struck me as a possibility. Or even Fleur de Male, my favorite. Need to get a sniff of that! Downtown? Wear some Cigar: men;s cologne that smells like its name. For roaming around the contemporary mean streets, I’d go with Soivohle Leather Krem; for vintage NYC fun I’d choose Jolie Madame. Jolie Madame is a great pick. I think our edgy youth in downtown Portland mostly smell like patchouli oil and b.o. Maybe a dash of sandalwood incense thrown in. Both available at a head shop near you! But if you’re going for the proto-yuppie crowd, I’d say maybe some gender-bending MJ Bang on a lady? Sorry to be OT, but MR, have you found anything out about your delivery? No. FedEx did an “investigation” and concluded that it was delivered. I have called Barney’s, who will file a claim with FedEx. I’ve also been advised to dispute the charge on my VISA. Everyone seemed pretty friendly and didn’t treat me like I was trying to con them, so I’m feeling mostly optimistic. Someday, eventually, I will have my yummy scents! All inconvenient – but it sounds like it just means a delay! Yay! I don’t live in Portland, but something very similar came to my mind! SL Douce Amere is pleasant but edgy. If I was wearing a black leather jacket, and hanging out in edgy Downtown; I would probably wear Thierry Mugler Alien. Honestly, I do not find Rooney Mara, to be all that edgy. She seems to be more of a poser, than truly edgy…. not as big a poser as Avril Lavigne, but still a poser. Gosh, honestly don’t know anything about her — you’re probably right. The young lady is actually the grandaughter of the owner of the Giants football team and the daughter of one of its chief executives. So she comes from money and the sports world . She does tend to dress for red carpet occasions in Couture Goth,(You, know the look, severe custom tailored black leather gowns with pale makeup, like she’s hoping to meet with Lord Byron’s and Mary Shelly’s ghosts at the after party). EXCEPT she’s done some brilliant acting in some very good movies. She’s was the Boston College student who told Mark Zuckerberg off in the Social Network,. and I’ll forgive any silly photograph or dress for that perfomance. if she is a poseur, well that’s acting. So why not let me imagine her in Fetish. She has the budget for it. In my city, downtown is just plain ol’ Main Street. Not exactly edgy, unless you count the hipster-ish coffee shop on the corner. Or the gaggles of freshmen from the local college frequenting said coffee shop in their trendy Victoria Secret sweatpants and hoodies. One of the Juicy Coutures, Or perhaps Jimmy Choo. Or Hanae Mori, for a more feminine touch. That’s pretty much what it is in my town too. Is discontinued okay? I would go with Versace Dreamer. Seriously, did they discontinue Dreamer?!? I’ve been told it was discontinued. I still find it online when I need a new bottle, but no stores in a 100 mile radius of me have it. I would be thrilled if they still made it. Interesting. I’m sure they don’t distribute it widely in any case, but hope they’re still making it. Oh, I went looking for that to give it a proper sampling about a year ago. . . couldn’t find it in any of my stores, either! Seems like a good choice, though, based on what I’d heard about it. She’s wearing Clinique Aromatics Elixir that she borrowed from her grandmother because it doesn’t smell anything like what her friends are wearing. Yes, I was also thinking of Aromatics Elixir – definitely the most unusual perfume in the small department store near me. Oh yes. A bold perfume. I’m circling back to it because I’m just so effing bored with all the frooty floral boredom in a bottle out there. Great poll idea! I’m saying Hermes Kelly Caleche, especially if she’s dancing in the street. Yes, that would work! Actually, lots of the Hermes line would work. Kouros. She steals it from an elderly lover. I could go a few directions with this.. one would be Womanity, Chanel Coco (the original one, not the fruity stuff) could be the classy option, or I’d go over to the men’s side of the store and go with something like John Varvatos Vintage. These days downtown is so pricey…so Bottega Veneta to channel the leather jacket, but also to reflect how gentrified downtown has become. Oh, I like the justification. I went shopping at Nordstroms: Kiehls Musk, unless it is too niche, if so, then Mugler Cologne. Oh, Kiehl’s will do. But I do love Mugler Cologne. Kenzo, Jungle Elephant, sometimes found at the discount perfume kiosk. Nice! And surely Kenzo isn’t niche. Donna Karan Chaos…. nuff said! If we get to shop at Neiman’s, I am choosing Sous le Vent or Dzing!. I was thinking of Clinique Aromatics Elixir, which Blithie has already mentioned, or Estee Lauder Azuree. I think the original Private Collection would also work. Let me raise a hand for lovely Aliage. It’s sporty but sophisticated. I see my initial proposal of YSL Nu failed to make an impact. And hey, Nu is a great scent too! Prada Infusion d’Iris. It layers well with the leather jacket and is sheer enough for the young folk. Also, she is attracted to anything Italian. This girl (super)aspires culture and has good taste. She goes to all sorts of movies, art galleries and concerts, and spends a great deal of time at the library. In a few years, she will be getting her first Lutens. Superaspirational! You are the best, Robin! Prada Infusion d’Iris will work with anything, I swear it. What about SCENT by Costume National? Or too much niche? GREAT fragrance, and perfect fit. It’s certainly niche in the US but don’t know about their distribution elsewhere. One more vote for Bulgari Black…but I’m surprised no one’s mentioned Fracas. It definitely has presence and makes a statement. Emporio Armani pour Elle — the original, not the White or Red flanker. I actually liked a lilac flanker of Armani pour Elle called Remix – and it did have pear. But it’s sadly discontinued. Continually amazed at the disconnect between perfume ad imagery/copy and the actual smells they’re trying to sell us. I think I’d wear Penhaligon’s Sartorial for a nip downtown in a black biker jacket… Or Caron Yatagan but I’m not sure of the availability(online only here..). Another cheap and tacky looking bottle. I know many women find men’s fragrances a thrill to wear, but a most appropriate suggestion for your black-leather-jacket-gang-girl attitude is Tom Ford’s Violet Blonde.